Denver's proximity to the mountains means weekend ski trips are only a short drive away. During the summer months, camping and hiking areas beckon as well. For adventurous souls, out-of-state destinations such as Santa Fe, New Mexico and Moab, Utah, are less than a six-hour drive from Denver. Below is a list of mileages and estimated driving times to many of the popular destinations close to Denver. Travelers should keep in mind that drive times may vary, especially during rush hour traffic. Mileage is calculated with downtown Denver as a starting point. Boulder is located in the foothills of the Rocky Mountains just north of Colorado. The city is home to the University of Colorado and hosts popular destinations like the Fiske Planetarium and Museum of Natural History. Travelers can also plan to take a hike or rock climb at the Flatirons mountains. Colorado Springs is located eastern to the Rocky Mountains. Notable attractions in Colorado Springs include the Garden of the Gods Park and the U.S. Olympic training center. Travelers can also visit the Cheyenne Mountain Zoo and Red Rock Canyon. Fort Collins houses Colorado State University as well as New Belgium Brewing Company, which makes the popular Fat Tire Amber Ale. Visitors who enjoy history can visit the Old Town historic district which has houses from the 1800s, vintage trollies, and unique shops. The town of Estes Park serves as the gateway to Rocky Mountain National Park. This place is home to wildlife like elk and bears and has the Trail Ridge Road, which consists of beautiful peaks and forests. Travelers can visit the Peak to Peak Scenic Byway by car, the Riverwalk in Downtown Estes Park for a walk, or take the Aerial Tramway. Cheyenne hosts Frontier Days, the world's largest outdoor rodeo, every summer in July. Attractions that may interest travelers include history museums, like the Wyoming State Museum and Cheyenne Frontier Days Old West Museum, along with state parks like Curt Gowdy and Mylar Park. 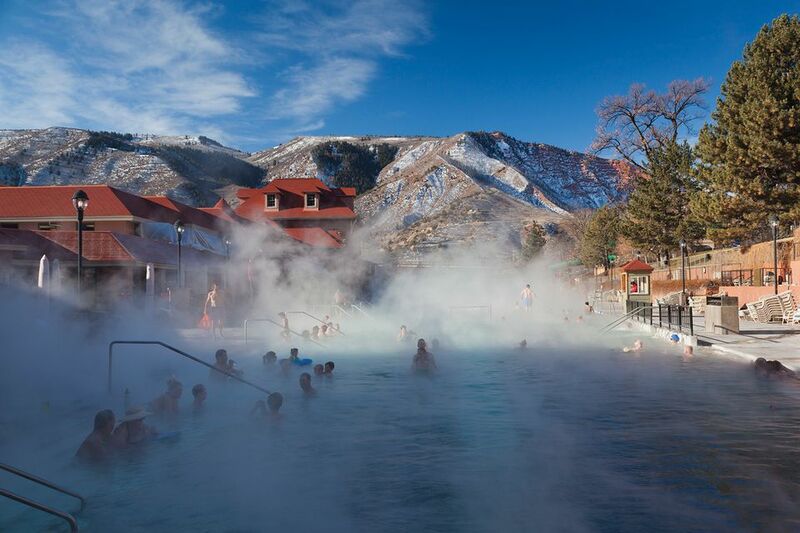 Glenwood Hot Springs boasts an outdoor pool over two city blocks long. Glenwood Springs also serves as the last resting place of gunslinger Doc Holliday. Visitors can also hike the trails at Hanging Lake and ride the rollercoasters at Glenwood Caverns Adventure Park. While the town of Canon City is primarily known for its federal prison, its proximity to the Arkansas River makes it a popular starting point for rafting and tubing trips. Adventurers can also take a zip line through the Aerial Adventure Park, hop on the tramway at Royal Gorge Bridge and Park, and take a helicopter or rail tour. Steamboat Ski Resort lies a bit off the beaten path, but its deep powder makes it worth the trip. Strawberry Hot Springs, which is clothing-optional after dark, also merits a visit. Aspen's a traveler's best bet for celebrity spotting in Colorado. Skiing and snowboarding at resorts like Steamboat Ski Resort are popular, as is visiting the waterfalls at Fish Creek Falls. Located in the Gunnison National Forest in southern Colorado, Crested Butte ski area offers a change of pace from the Front Range ski resorts. Lovers of snow should visit here, where they can explore the scenic drives at Kebler Pass, and ski or snowboard at popular resorts like the Crested Butte Mountain Resort and the Nordic Center. Santa Fe's numerous art galleries and southwestern food attract many visitors. Visitors can consider going to the Santa Fe Opera House, Meow Wolf art gallery, or Camel Rock Monument. Rapid City is located just 25 miles away from Mount Rushmore National Memorial. Those who want to visit closer to the city can check out the Reptile Gardens or Bear Country USA for some nature and wildlife areas.